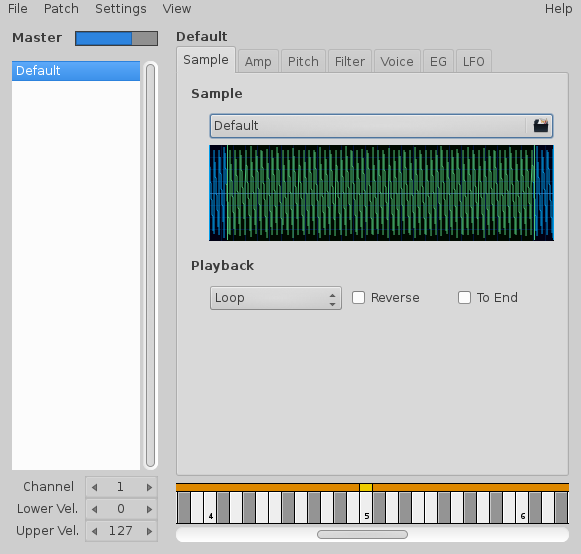 Petri-Foo is a software sampler/synthesizer for linux which was born as a fork from a preceeding sampler/synth called Specimen. Petri-Foo is forked and developed by James Morris and Brendan Jones since 2011, and includes a variety of enhanced capabilities over its predecessor. Although Petri-Foo provides a default saw wave, the strength of this instrument is obviously the ability to import your own audio files (many formats are supported) for modulation, synthesis and playback. Just right-click on the left side of the GUI and select "Add Patch" in order to add an additional audio file. 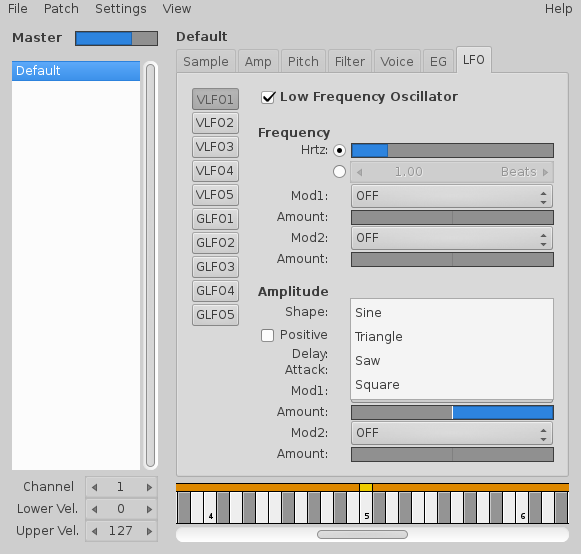 The GUI has several pages available for control of each audio file: sample page, filter page, pitch page, amplitude page, voice page, envelope page and LFO page. A virtual keyboard is always available at the bottom of the GUI, and is necessary to set the range of the audio file across the keyboard. (Left mouse click for lowest note, right mouse click for highest note.) 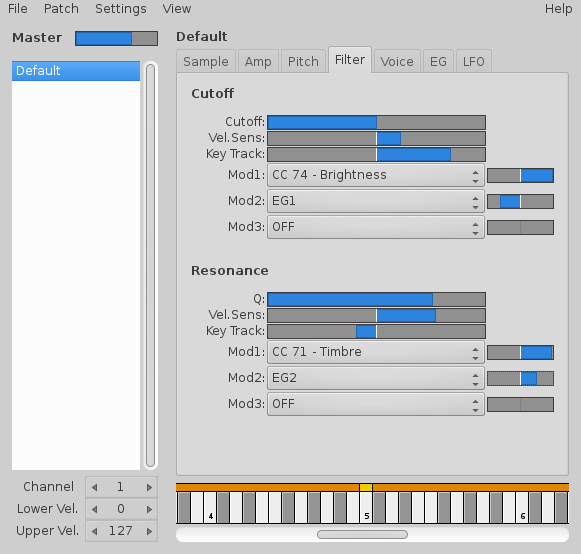 The controls for the file's assigned midi channel, as well as the velocity level (max and minimum) at which the sound will be triggered, are also provided on all pages. The Sample page is the page that is shown when Petri-Foo is opened. Click on "load sample" to load your own audio file. You will hear an audible preview of whatever audio file you click on, to facilitate selection. Once you select and load a file, you can control how it is played back at every key-on. Single shot, loop, trim, ping-pong (plays file forward and back). Clicking on the wave image, a larger window will appear where it is possible to select a precise area of the waveform that can be looped continuously as long as a note is held. The Amp page allows control of amplitude and panning for the related audio file or patch. As with most pages, velocity sensitivity and keyboard tracking control is available as well. 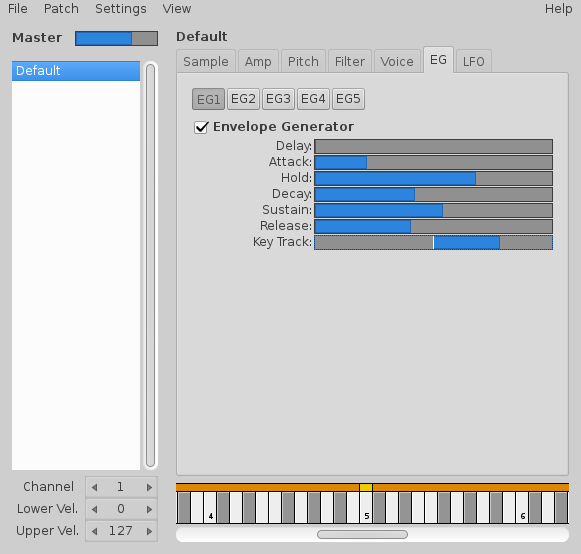 The amplitude can be controlled by one of the five envelope generators (EG page), as well as by a midi controller, the LFO section, etc. The amount of control is adjustable using the ribbon to the right of each modulation assign. The Filter page allows control of the filter's cutoff frequency as well as the resonance level. Here again, these parameters can be controlled by external midi devices (knobs, sliders, etc), as well as by the EG and LFO sections. Velocity sensitivity and keyboard tracking are also adjustable. The Voice page controls polyphonic-monophonic mode, as well as portamento and legato. The EG page offers five envelope generators which can be linked to the amp, filter and pitch sections. The envelope profile is the same for each generator: delay, attack, hold, decay, sustain, release. Keyboard tracking control is also provided for each generator. The LFO page provides four wave shapes: sine, triangle, saw and square. Oscillator speed can be adjusted by hertz or beats, and modulation can affect frequency and amplitude. Various triggering sources are available and the amount of signal intensity can be controlled here.